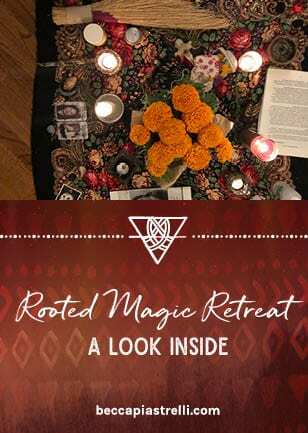 This past autumn, when the veils were still thin and the season of ancestors was upon us, I hosted eight women in my home for the Rooted Magic Retreat. Our intentions were to come together to greet the ancestral season of going inward. We all wanted to reconnect to our roots, to remember how to simply be, to let go of what was falling away like the leaves on the trees, and to honor and remember those who came before us. There’s so much that happened that isn’t my story to tell. We cast a sacred circle and made very specific agreements about what was shared in that circle to make it feel safe and allow us to go deep. But what I would like to share with you is what I experienced as a guide and member of the circle from my perspective. I hope it serves you. 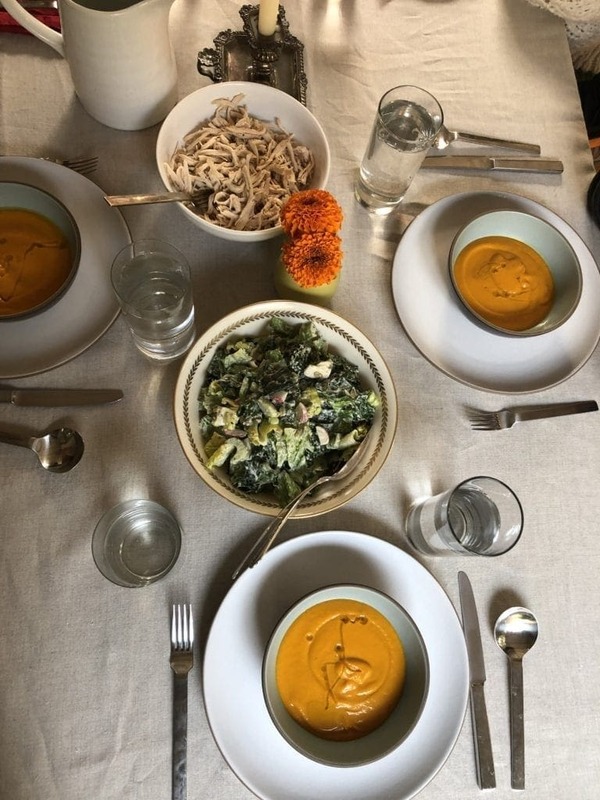 We began with a gorgeous and nourishing dinner prepared by Giovanna Garcia and got to know each other by pulling cards from the oracle deck from my friend Maia Toll’s book, The Illustrated Herbiary. I pulled the card for Red Clover, whose message was about trusting my heart. Each of the women pulled their own cards and shared with the group what it was bringing up for them. 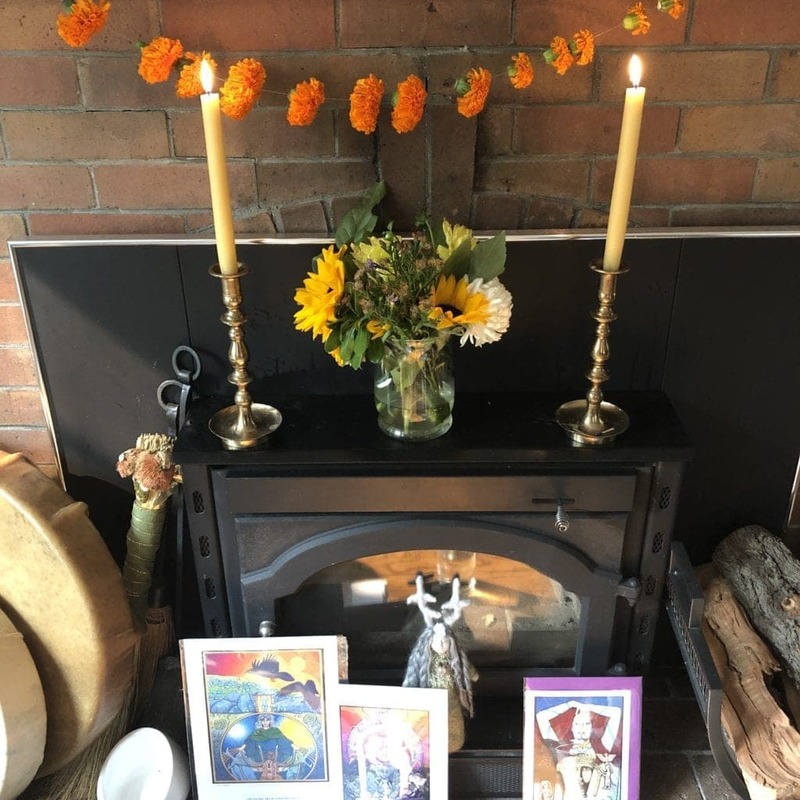 Then we had our opening ceremony where we added our ancestral items to our co-created altar of beeswax candles and marigolds. I added the typed up diaries of my paternal great-grandmother’s family who immigrated from Poland and Germany and placed an old black shawl on my chair. 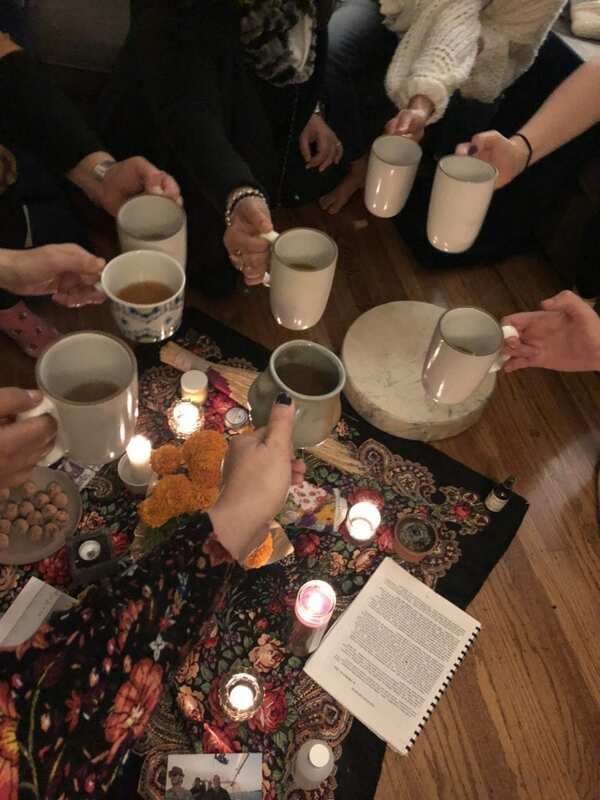 Each woman shared her intentions for the weekend and invoked the ancestors she wanted to honor together with us. 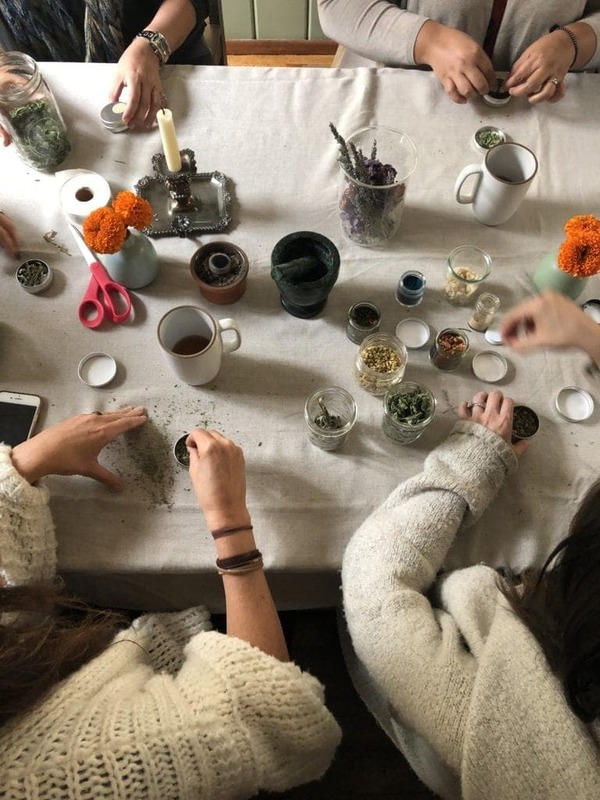 My work in ancestral connection is best done, I believe, in a space of meaningful and honest sisterhood. 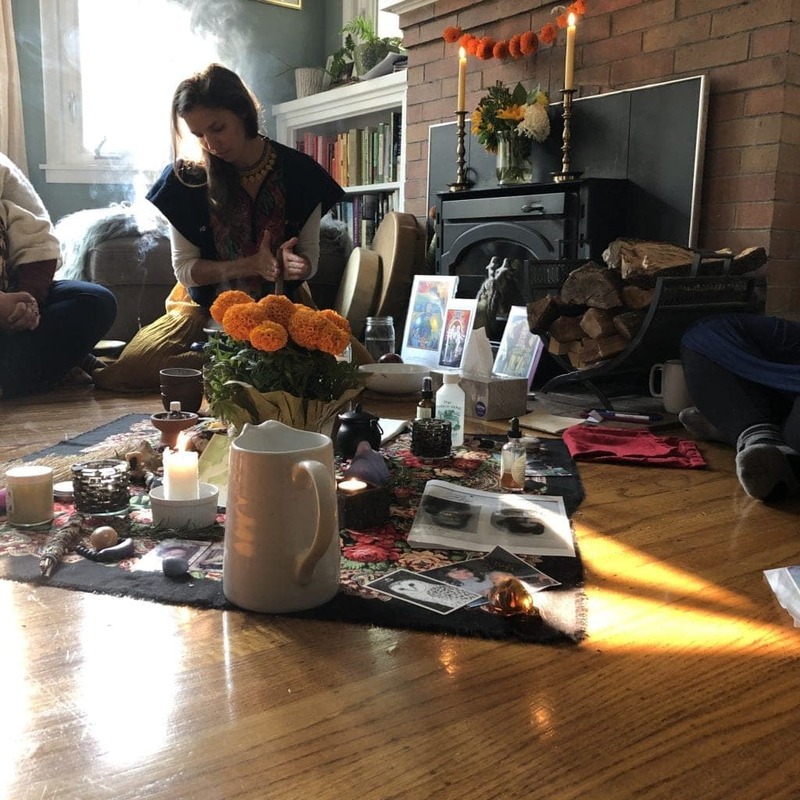 When we can come together at the table (or hearthfire or in the candlelight) as our great great great grandmothers once did, drop the masks of perfection and performance, and simply show up as ourselves, that is the deep place where healing work can take place. We spent one morning talking about practicing the art of sistering by sharing deeply from our hearts and witnessing each other—without judgement, without advice, and without reaching out to support. It’s an important muscle that gets strengthened the more you work it, so we spent a powerful morning doing just that. 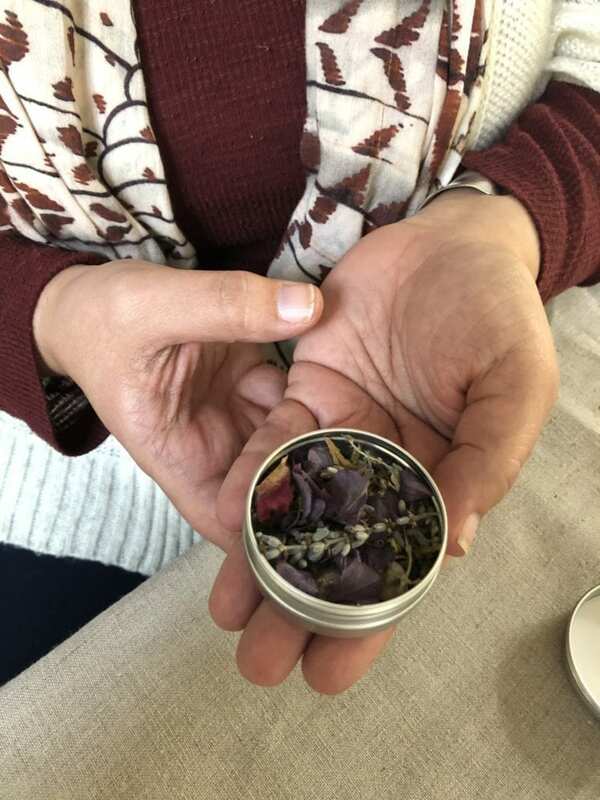 I brought in my dear friend Ginny Muir to facilitate a healing breathwork session to help us release old emotions and call in deeper experiences of healing into our bodies. The experience was so powerful and Ginny guided it beautifully. 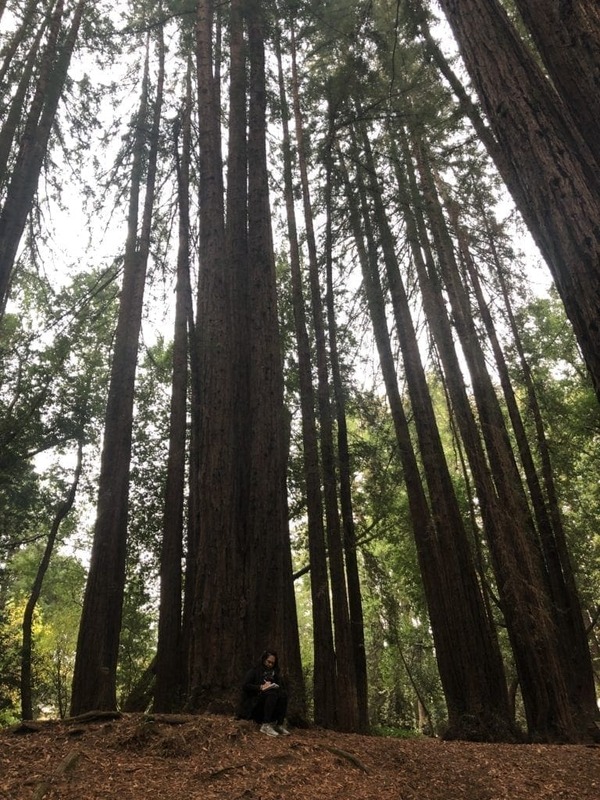 We made our way to the redwood trees to integrate our experience of the day and find deep grounding and solace in the ancient, tall trees above us. 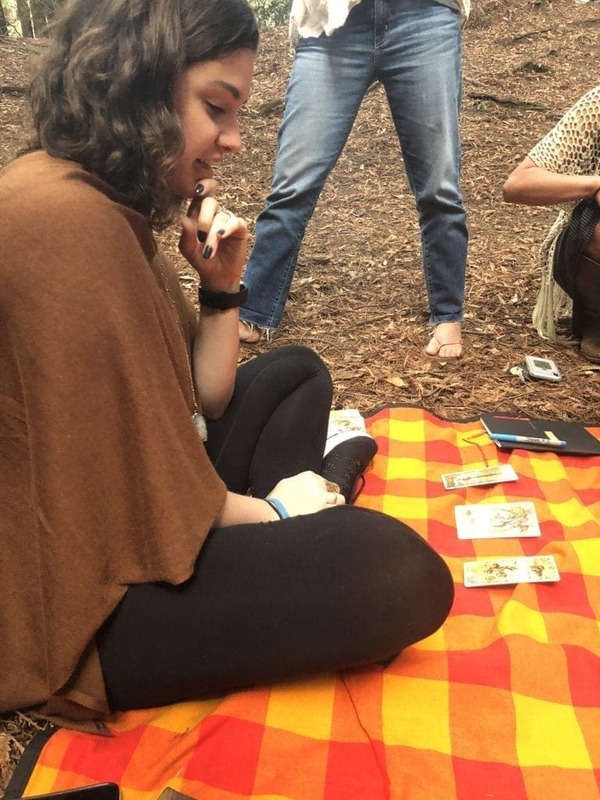 In a fairy ring of trees, my friend and business manager Caitlin gave tarot readings. That evening, we journeyed more into the folk magic of the coming winter and brewed our own pot of apple cider wassail (complete with 13 allspice berries for the moonths, 8 cloves for the sun festivals on the wheel of the year, and other folk medicine that’s been under our noses and in our grocery store aisles all this time) to honor and sing to the trees as we were lead in a joyful song circle by Stevie Greenwell. We drummed and tapped our toes and slapped our thighs and cackled into the night. The next morning, we harnessed the magic of working with our hands and got crafty. 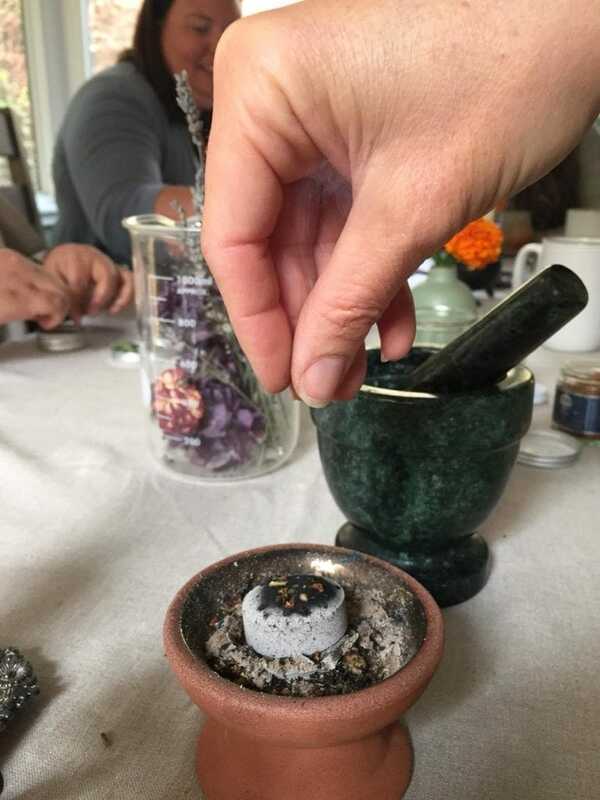 I talked about the power of smoke medicine during these darker months as we each made our own custom incense blend and played with them on hot charcoal. I then invited Giovanna to facilitate a cacao ceremony. As a woman with indigenous Mexican lineage, Giovanna brings so much depth and healing in her circles. We drank the ceremonial cacao she prepared, listened to her singing in the language of her people, and were led on a powerful meditation to help us open our hearts and feel the depth of our roots. That evening was our final dinner and we all dressed up as our goddess selves (however that looked and felt to each of us—there’s no such thing as one goddess look #instagrampetpeeve). And, what started as painting each other’s faces and admiring each other’s style turned into a full-blown dance party to Madonna and Despacito. Surrounded by candles, we celebrated our powers of slowing time down and just how healing the weekend had been for each of us. 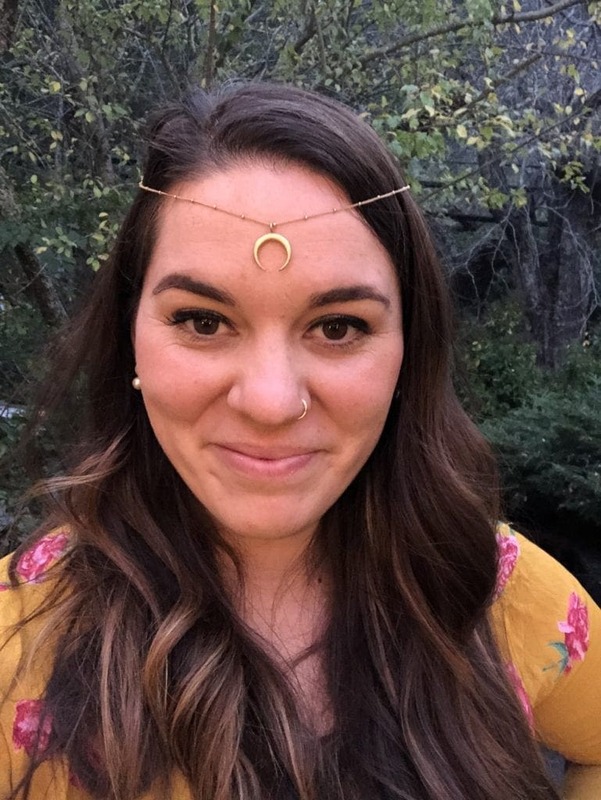 We finished with our final ceremony, which was so powerful I was brought to tears in gratitude for our collective work to heal the sisterhood wound, reconnect to our ancestors, and dig deep to show up bravely and generously in these times. We sang, we hugged, and we completed a powerful weekend together as forever transformed humans. Want to join me on the next retreat experience? Pop your name below to get on the email list and I’ll let you know! Want to know about upcoming retreats? Pop your info in below and we'll let you know! You're on the list! We'll notify you about upcoming retreats and gatherings!